The state of New Mexico led the way for a half dozen states across the West holding quarterly lease sales on Bureau of Land Management public lands over the last week. BLM New Mexico’s quarterly sale, held September 7, produced revenues of nearly $131 million for 61 parcels located in five counties in the Permian Basin, located in the southeast portion of the state. The Wilderness Society and the WildEarth Guardians both submitted official protests in July ahead of the September New Mexico sale. A 2016 protest by WildEarth Guardians delayed the dispersal of sales proceeds from BLM to the state of New Mexico for nearly nine months. The September 2016 sale yielded nearly $146 million in revenues, with almost $70 million designated for New Mexico state coffers. “WildEarth Guardians has extensively commented on BLM’s proposed oil and gas leasing in New Mexico, including filing comments and an protest of the July 2016 lease sale (actually held in September 2016), which proposed leasing in exactly the same field offices and which posed virtually identical environmental impacts,” the group wrote. 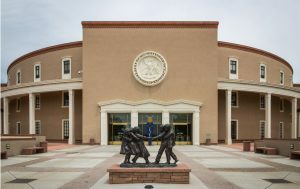 Oil and gas revenues make up approximately 15 percent of New Mexico’s general fund annually, depending on conditions, the state’s Legislative Finance Committee said. BLM Colorado reported revenues of $603,174 from their September 7 lease sale from three parcels covering just over 400 acres. A total of 10 parcels were offered, with the highest bid per acre at $7,518 for 80 acres by Bison Oil & Gas II, LLC. WildEarth Guardians also filed an official protest of Colorado’s lease sale. Nevada and Utah BLM offices held their sales this week. The September 12 Nevada sales consisted of three parcels covering 3,680 acres. Total receipts for $39,120 were received for successful bids. Previous attempts to block or sabotage lease sales prompted BLM officials to explore online auctions. BLM officials told Western Wire in July that the combination of technological efforts and a commitment by the agency to hold mandated quarterly lease sales had already yielded results, increasing participation in the sales driving revenues. The added bonus, one official said, was addressing security concerns that caused one 2016 sale in Reno to change venues and saw an earlier Colorado sale in 2015 prompt a police investigation, following an incident with activists outside the sale. While no such disruptions halted the sale yesterday, anti-fossil fuel activists with the Sierra Club and the Center for Biological Diversity launched a lawsuit Monday challenging the results of Nevada’s June quarterly sale, arguing the state and the BLM had turned over public lands to the oil and gas industry. That authority extends over 564 million acres of BLM-managed surface land and other agency-held lands, along with individual state and private lands where subsurface mineral rights “were retained by the Federal government,” Evenson said. Oil and gas production on public lands contributes to the nation’s overall natural resource development at a significant level, the BLM Nevada official said, yielding 10 percent of U.S. natural gas production and five percent of its oil output. Those production numbers have helped private, domestic development to push the country into becoming the world’s top producer of oil and natural gas, according to the Energy Information Administration, over the last several years, moving past Saudi Arabia and Russia. In Utah, three of nine parcels on offer sold for a total of $14,837 in bonus bids and fees. The parcels represented 4,100 acres out of nearly 15,000 acres available to bidders. BLM Wyoming will hold a lease sale on September 21, with nearly 113,000 acres available across 137 parcels. Sales for parcels in North and South Dakota were also held this week, but the BLM Montana office’s website was unavailable at press time, and calls were not returned. Results had not yet been posted online. All of this quarter’s lease sales are being conducted online via energynet.com. The next round will be held in December.